I was pretty excited when I got the email from Google stating that my Google Drive was up! One of the differences between this and Google Docs is the gray new folder button at the top left; enabling one to sort files into folders, instead of the labeling method that the other Google services have. However, when I think about it, this was a necessity when you have desktop apps (as I will talk about below). 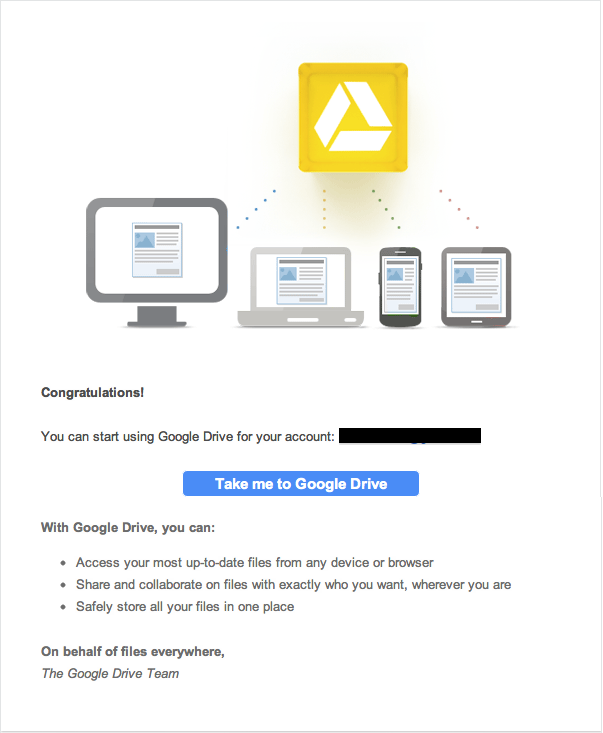 Google Drive imported all the files from Google Docs, essentially replacing that service. 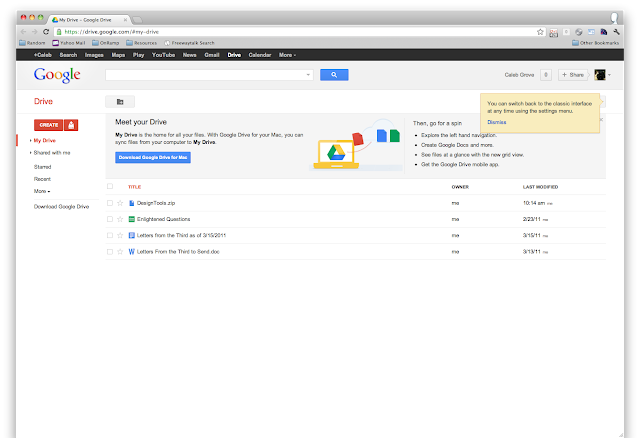 This is one feature that I'm really excited about; Google Drive has desktop apps! I've never been a fan of browser based applications, and prefer to work with standalone programs instead. 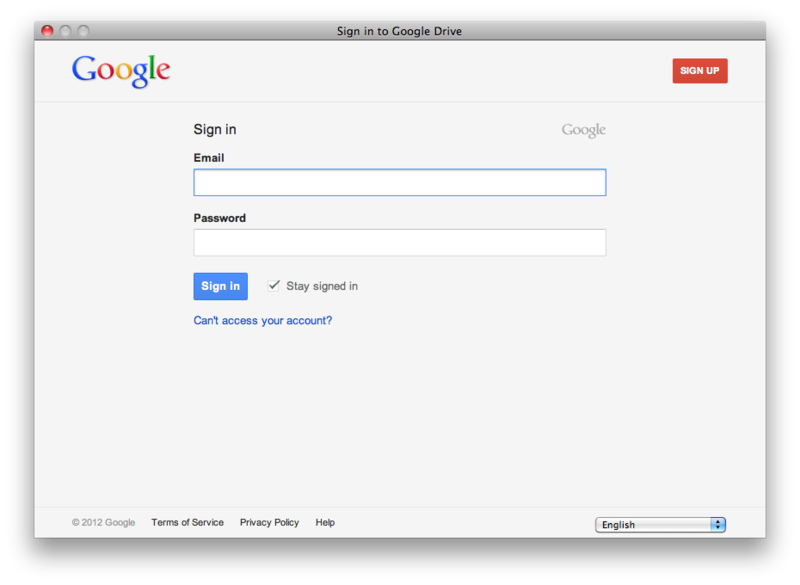 From the drive.google.com website, there is a blue button, which in my case stated "Download Google Drive for Mac". I hit this and the application was downloaded as a dmg. I entered my Google account username and password, and viola! The Google Drive app launches in my topbar, creates a folder, and begins to sync everything from the webapp to that folder. The one thing that disappointed me is that Google Drive doesn't allow you to open any Google Docs documents in your own apps. 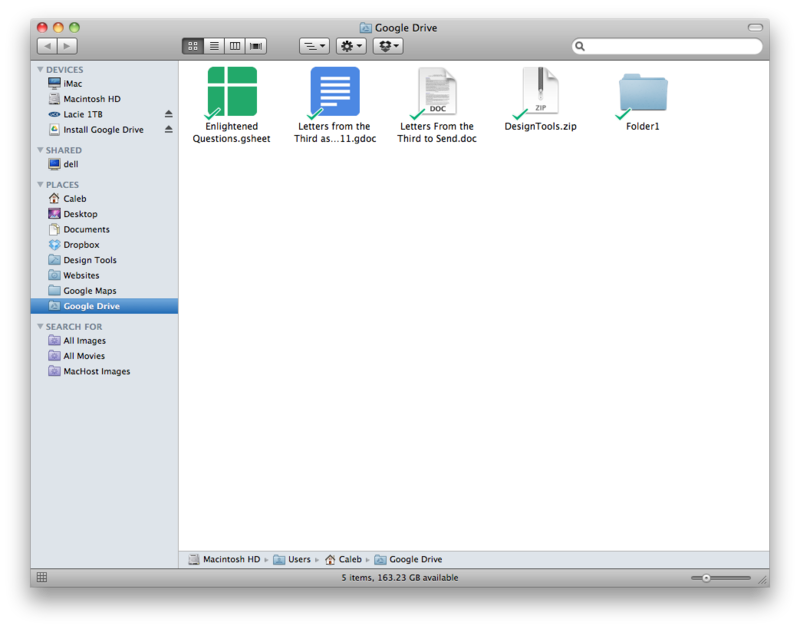 Also, any files created using Google Docs don't use the system default icons and instead use their own. In my opinion this is poorly thought out. Like Dropbox, when a file is synced a checkmark appears on the icon. One of my favorite things to do with a new app is to delve into the preferences. In this case, there are not many options, but there are not many needed. 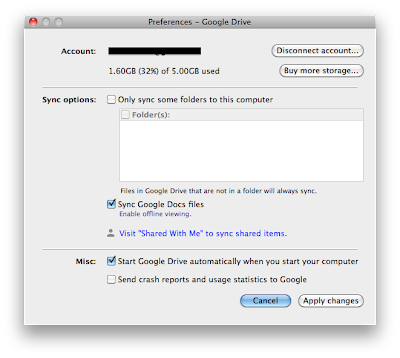 You can set it up to sync only selected folder from your online Google Drive to the computer if you wish. Otherwise, there really aren't any other options. 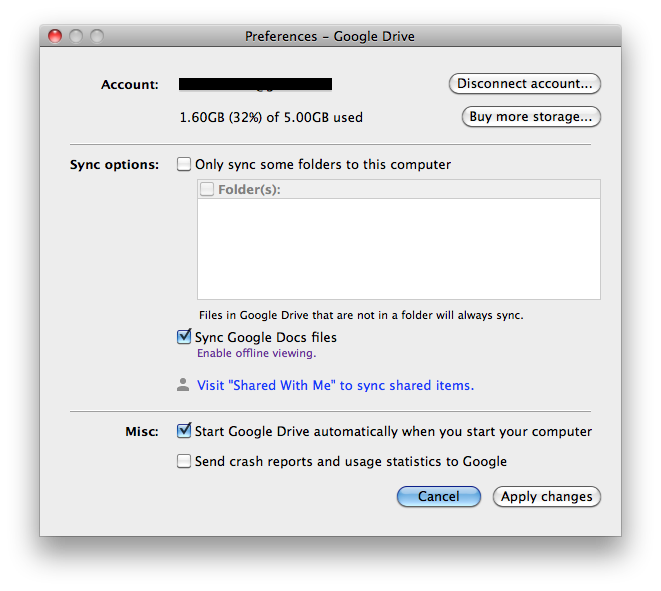 Will Google Drive replace Dropbox for me? I doubt it. 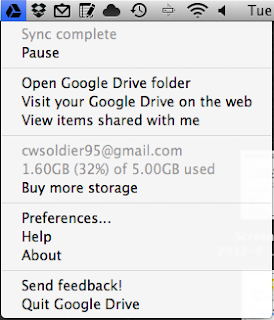 Because of beta testing, I actually have more space in my Dropbox than the 5gb that Google Drive gives. The biggest reason though is that most of my clients use Dropbox, and as such, I have to have it. Also, I like the fact that Dropbox is a "smallish" business that specializes only in what they do, instead of a huge impersonal corporation like Google. However, I can see myself using Google Drive for those clients who already have a Google Account and find that method easier for instead of having to have yet another account and install more software. Yay! 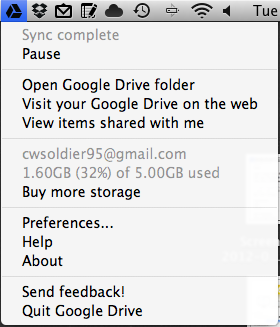 I had forgotten to mention that Google Drive didn't support Linux yet. Well! Good intro about Google Drive.